How recent seem those momentous spring days of 2005 when his predecessor both saddened us by his going and uplifted us with the dignity of his dying, reminding that only in faith can humanity see past the ineluctable frontier. And then the moment of succession, the emergence of the resolute figure of Cardinal Joseph Ratzinger to take the baton of St Peter in a time of unprecedented doubting and growing terror. Benedict was, by the secular media analysis, a stop-gap and a throwback, a "reactionary", a "right-winger", an obscurantist. But what has emerged is what was implicit in his magisterial writings over several decades: a supreme intellect mounted in a most animated humanity, a man who in his lifetime has watched mankind lurch between great good and the greatest evil, and seeks to reconcile these observations with the truths he has inherited. One of the many paradoxes of being pope in the modern world is that you must speak through a megaphone controlled by your enemies. If John Paul II was an actor who communicated by disarming the megaphone-holders with charisma and charm, Benedict's strategy is determined subversion. 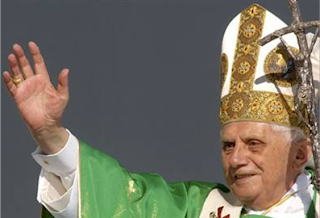 From the outset he has eyeballed the culture of the age, his first two encyclicals confronting the two most pressing issues of our time: the haemorrhaging from public language of, respectively, love and hope. "In a world where the name of God is sometimes associated with vengeance or even a duty of hatred and violence ... I wish in my first encyclical to speak of the love which God lavishes upon us and which we in turn must share with others," he wrote in Deus Caritas Est. God is love, not hate. This subtle and brilliant pope has struggled to be heard in a media climate characterised by sabotage and diversion. Repeatedly, the media sought to distort or reduce his statements, to make them fit with prejudices unfurled on his election. But Benedict has emerged from the episodes of Regensburg and La Sapienza as a man of courage and grace, his status enhanced. A standard ploy of the megaphone-holders is the opening gambit that the pope has "risked a rift with the Islamic world" by saying or doing something that will later emerge as having been grossly misrepresented. But the media, after several defeats, now appears to have perceived the futility of this game. During the Easter vigil at St Peter's last month, Pope Benedict baptised Magdi Allam, a Muslim journalist who describes Islam as intrinsically violent and characterised by hate and intolerance. There were a few desultory media attempts to revive the spirit of Regensburg, but it didn't wash, because the truth radiated from the event itself. I have met Magdi Allam several times, two years ago sharing a platform with him at a conference in Italy. Next day, I went to greet him in a restaurant and was immediately surrounded by the half-dozen armed policemen who accompany him at all times. Allam is a supremely courageous journalist who has been under police protection for five years, having been handed a death sentence for criticising suicide-bombings. At baptism, he took the middle name "Christian", and afterwards wrote that his soul had been "liberated from the obscurantism of an ideology which legitimises lies and dissimulation, which induces murder and suicide, and blind submission to tyranny". He had, he said, joined "the authentic religion of truth, life and liberty" and discovered "for the first time the true and only God, who is the God of faith and reason". The baptism of Magdi Christian Allam is an example of Pope Benedict's radicalism, an event worth a hundred million words, a symbol of the new Enlightenment spearheaded by this most disarming of popes. Benedict's project is the restoration to western culture of an integrated concept of reason, the re-separation of the metaphysical from the physical. The unarmed coup of the 1960s, which sought to install scientific rationalism as the guiding light of the age, has failed to convince even its own adherents, who, alarmed by the listlessness of their children and the imminence of the darkness they have themselves summoned, now cry out for reassurance to Richard Dawkins and Christopher Hitchens. Meanwhile, many of the same pseudo-rebels seek to mollify and court a very real form of obscurantism because it happens not to be Christian.